Home / Archive / Should Sky pay to Keep Discovery? Should Sky pay to Keep Discovery? £1 billion has been quoted as the price demanded by Discovery for carriage of its channels on Sky. After a year of talks over on-going carriage, Sky says that although it wanted to pay "hundreds of millions of pounds" for Discovery's channels to be carried on its TV service, it's not willing to pay "close to £1 billion" for channels that are getting fewer and fewer viewers, not even for the "home of the Olympics", Eurosport. Discovery says Sky is abusing its dominant market position and should be paying more for shows viewers clearly want to see. @a516digital Discovery have two channels worth anything; Eurosport. The rest I've not watched in years. Sky have a point. @a516digital Bye Bye Sky Hello Freesat, Freeview & Virgin Media. If sky or discovery removes its channels on sky uk and Ireland it will devalued the subscription channels and people will cancel the tv service on sky and with prices keep going up every year this is not on as a subscriber sky should do this deal with discovery and people that have a subscription with sky will say with sky as the discovery channels on been on sky for over 20 or more years on sky so they should be kept on and discovery channels make more improvements to its channels to make it more appealing and less repeats and bring more new contents on its discovery channels and sky customers and other platforms in the uk that has subscription with other TV provides will have excellent value in tv subscription. When you speak to someone in real life, do you do it without the use of punctuation as well? How do you breathe and speak at the same time without 'suffocating' through loss of air to your lungs? I'm curious is all as it must be difficult to have a conversation with you without you turning blue in the face. I assume you can only speak in short bursts as you've made this far in life without dying yet. Well we don't know what Discovery plans are after the 1st Feb, if the tieup with BT is correct then that is one way of getting channels on to the platform. If you look at what UKTV did with making some of their channels free to view, it may make sense for discovery to make their channels subscription free even on a trial basis, and see how they get on, as in theory they would have more viewers which could attract a premium advertisement rate and may even generate a profit. 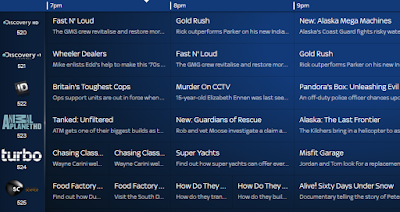 Why is it that in order to watch the Discovery and National Gerographic channels on the Sky platform you have to subscribe to their Family Bundle minimum to watch them and Eurosport, but for only £4.99 you can watch the whole lot through TVPlayer? It doesn't make sense to me? I've cancelled my Sky and replaced with it TVPlayer to get those channels and Eurosport, which is cheaper than the Eurosport Player Subscription. All of the crazy pricing plans with different providers for the same product/channels is incredibly frustrating and confusing as a consumer. If you don't do your research you can end up paying through the nose for the same services. The only reason I've kept my Sky Subscription is for the F1 as I don't think Now TV Sports passes are value for money as you can't access the on demand content from the Sky Sports Channels. It is cheaper because Internet Streaming of channels is not always as good and you can often record what you want to watch later from multiple channels. It's interesting that the 20 quid a year offer for Eurosport Player (which let's face it, is the main attraction of all the Discovery channels) ends on 31st Jan - what could be its last day in the Sky package. I can see a lot of Sky viewers signing up for Eurosport Player at that 20 quid price - I don't have Sky, but I signed up for the player at Xmas and it's excellent value, IMHO. In fact, the player (which has a top-notch Android app) is vastly better than the broadcast channels because it offers 7 days catchup, multiple streams for some events (e.g. 16 courts for the Aus Open tennis), multiple camera angle feeds and even "raw" feeds (no logo, no ad breaks, extended coverage and sometimes no comms). So sky seems to think it's being held to ransom. Just like they used to hold me to ransom each year with their inflation busting increases in subs. Nice to see the boot on the other foot. According to the Discovery Channel Twitter they did not request one billion pounds to keep there channels but a much smaller price increase. I think that they provide great channels and unique sports on Eurosport and should stay on Sky TV. Sky won't say if the £1bn relates to UK/Ireland carriage or both UK/Irl and Germany & Austria, where the companies are at loggerheads over carriage as well. Neither if the £1bn relates to the entire period of the carriage deal and if so, how many years the carriage deal would be for. Therefore, it's entirely possible that both are telling the "truth", but omitting crucial facts. I haven't been a sky customer for years. They charge a fortune for 300+ channels when I only want to watch a couple of them. Massive price increases way above inflation, to pay for their overpriced sport deals that I have no desire to watch. BT on the other hand have You View. Which is much better, and considerably cheaper. You have to argue and barter with them at renewal time to get a decent deal. I even left recently, went to EE, since Bt wouldn't play ball. Two months in EE put up their prices so I was able to exit without penalty, and go back to BT as a new customer. This brought a wealth of deals and discounts, and a shiny new UHD box, and the latest Home Hub router. 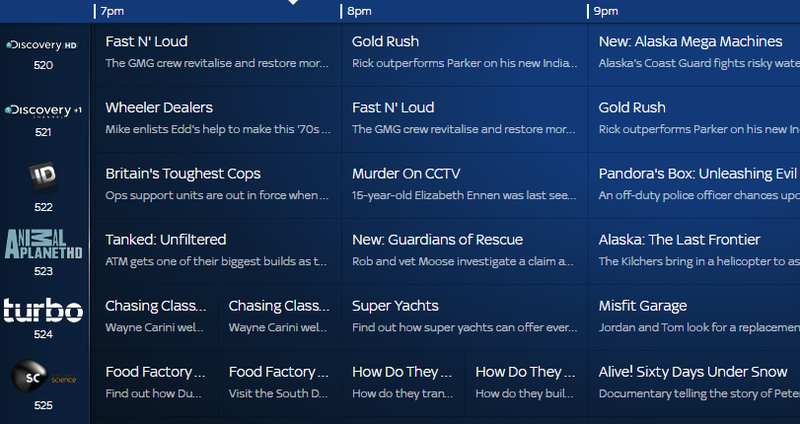 I'll still get all the Discovery channels after 31 Jan, and I can record them too.